Your Own Private Tropical Paradise a Block From the Ocean. Paddle to the Beach! Let me be your personal concierge. Whatever you need I'll arrange for you. Need good solid local information? My 43 years of local experience here can be put to good use anytime you want. I enjoy helping people. It's my job.... I visited Kauai in 1970 and stayed on and basically never left. The charming people of Kauai and the exquisite beauty enticed me from my very first days on the island and I'm grateful every day to be blessed to live in such a wonderful healthy environment amongst such wonderful people and such a vibrant culture. I enjoy helping people and I'm available to my guests on a 24/7 basis. It's an honor and a privilege to be able to serve my guests by providing my home to so many of them and helping them to discover the wonders of this magical place. Fortunately I'm able to say that this place is still the paradise I found so many years ago. Mahalo and Aloha. River Estate is a completely unique experience. Where my property is on North Kauai is in arguably one of the nicest areas of the whole state and quite possibly the world. Because there had always been interest in short term renting here I decided to turn both homes into a vacation rentals. There are certain places on the island and in Hawaii that are so special that people from all over the world have heard about them and have a desire to visit them. Not only is Kauai so very special, I believe Hanalei and the surrounding area is the very best Kauai has to offer. Although I have lived here for 40 years I have not forgotten the feelings I first felt when I arrived here. These are the experiences that lock this place in peoples hearts and minds and keeps bringing them back. It isn't the things you do here but the actual island itself, it's charm and it's local people that bring visitors back time and time again. Utmost is the seclusion and romance of the botanical gardens of the property and it's convenient location in the scheme of things here on the north shore of Kauai. It's very close to all the world famous beaches north Kauai is noted for and central between Hanalei and the end of the road at Ke'e Beach. The fact you can use the river to access the beach from the house and ocean is not offered any where else on Kauai as far as I know. The privacy and natural setting allow our guests to experience a truly relaxing and rewarding time away from their normal lives and leaves a lasting impression of what some consider to be true paradise. Not many rental homes in our price range are kept in the condition that the Guest House is kept in and our guests reflect that in their comments in our guest book. We're proud of that. It's our stock in trade so to speak. Each home has quality bath amenities and fixtures. All tile, glass enclosures and quality cabinets and counter tops. The Guest House and Riverhouse both have two bathrooms. Each master suite has a shower tub combination. All enclosures are tile. Riverhouse has glass shower doors. Guest House has curtains. All countertops are synthetic granite (high end) Bathroom floors are tile. We're on a solar hot water system in both homes now so there is no shortage of hot water. Two blocks to the beach and many world famous beaches are within 2 miles of the property. Two blocks to the beach. 10 minutes paddling to and from the house on the river. Hanalei is 2 miles East. Soothing sounds and the river runs next to both homes. The river is viewable from all bedrooms and living area. It's just steps away so you'll hear the sound of the water flowing over the stones in the river. This is a riverfront property within walking distance of the beach. The lanai looks over a pristine stream and botanical gardens with mountains above. Float down the river and back from the house! Both homes have a split system with remote controls throughout the houses. Hotel grade towels, 400 count sheets, pillow cases and bedding. Beach towels. Full sized washer with laundry soap provided. Covered Parking and entry to houses. Well furnished with top quality furniture. Full sized with ice maker and filtered water dispenser. Standard drip coffee maker. Filters supplied. Fully equipped gourmet kitchen with many amenities and attention to detail. Cable TV in living and master bedroom. Nice sound systems with iPod docks. (2) Large CD selection of all types of music. We take requests for specific music styles and albums before arrival. Ask us about that amenity. Large selection of movies filmed on Kauai, old classics, newer releases and Hawaii themed videos and documentaries. Botanical gardens along the river. 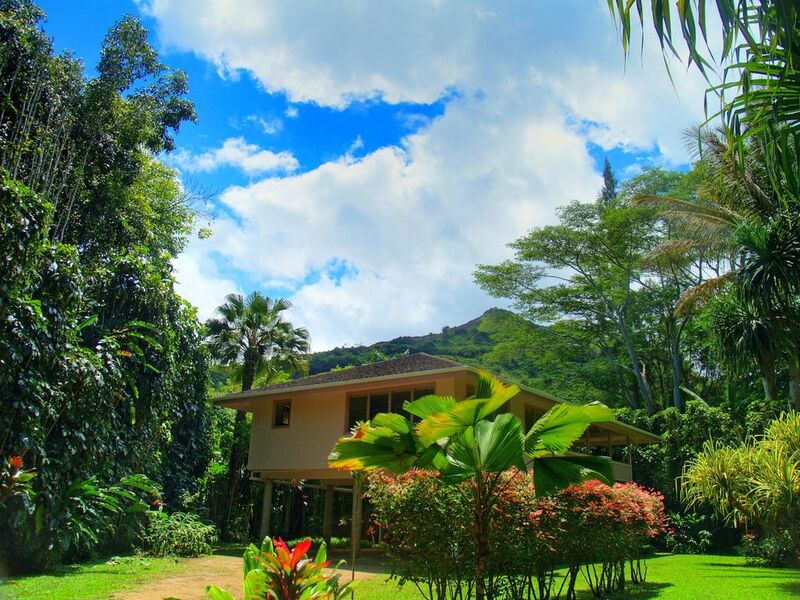 Can rent in Hanalei, 2 miles away. Both homes have full covered lanais. Our stock in trade consists of our attention to the care and maintenance of the homes and grounds, the attention to detail in every aspect and my concierge services which have proven to be quite helpful to many of my guests. I have developed many relationships during my 44 years here and now have contracts with activity providers to help with those bookings and a travel agency which has proven to still be very viable since I can pass on some of my commission to you as a saving. I'll make sure you get all the information you need whenever you need or request it. River Estate offers quality accommodations that are meticulously maintained and very user friendly. The homes are eclectic, comfortable and above all extremely peaceful and private. Our prime location is central to all the great North Kauai attractions. The whole area from Hanalei town, with it's restaurants and shopping, to Ke'e beach and the Napali Coast trail at the end of the road, and all the beaches and activities between them, is within a 10 minute drive in either direction of the property. Peace, privacy and comfort is what you'll find here at River Estate. Staying here just might be one of the finest vacation experiences you'll ever have. The idyllic riverfront gardens are perfectly complimented by the two charming homes that nestle themselves along the gently flowing river just up from the beach in one of Kauai's prime locations. Right here in the middle of the Kauai's North Shore with easy access to everything yet removed and completely private. We offer our guests an experience so special a lot of our guests comment that they either don't want to leave or are very sad to! Our repeat visitors can't get enough it seems. Float to beach and back from house, surfing and surf lessons, Kite Boarding, Snorkeling, scuba diving, kayaking, hiking, horseback riding, zip line, waterfall hikes, Napali Coast trail, farmers markets, health food store, fine dining, grocery and fish markets, shopping, nightlife, bars, luaus, golf, tennis, health club, spa, national parks, river and boat cruises, coffee shop, library, internet cafe, shave ice stand, greasy burger joint, local craft fair, Hawaiian music performances, shell hunting, beach walks, body surfing, world famous beaches, natural wonders, verdant landscapes, art galleries, motorcycle and bike rentals, helicopter tours, Hawaiian cultural sites, hula lessons, yoga studio, juice and fruit stands and especially meeting and interacting with really friendly people. River Estate was featured in Lonely Planet staff writer Andy Murdock's Valentines Day article "12 Romantic Getaways across the US"(#10 Romance for Island Lovers) Which was published on the Lonely Planet website. The Gayot Travel Guide to the good life was first published in 1961 by Andre Gayot. We were also featured in National Geographic Adventure Magazine in Feb.2006, as well as Fodor's and the Lonely Planet printed Kauai travel guides.